This correspondence is our monthly update of the servers being operated in Costa Rica and our roadmap for future expansion of EOS infrastructure in Latin America. We look forward an open discussion with the community and we encourage any EOS user suggestions. Let us know how we can better leverage resources in our region to support EOS. We want your feedback! The first weeks of the EOS mainnet were jam packed with events, including multiple software updates, and the release of eosio v1.1.0. Our technical team worked hard optimizing server configurations, monitoring security, perfecting our backup procedures and setting up alerts and notifications to make sure we continue to provide the EOS network with high levels of uptime and validated compliance. As for hardware, both our full nodes received memory upgrades, we improved security measures, and investigated future datacenter locations in Panama. EOS Costa Rica is currently exposing these endpoints to be remotely accessible. API Endpoint: https://api.eosio.cr EOS Costa Rica provides a single, load balanced HTTPS endpoint. The active-active load balancing ensures high availability, and can be easily scaled to include additional servers as traffic requirements increase. We have decided to only expose an HTTPS service as we strongly believe HTTPS has many security benefits over HTTP and have not yet identified a good reason to serve the API without SSL. P2P Endpoints: p2p.eosio.cr:1976 p2p.eosio.cr:5418 Two independent P2P endpoints have been made available on non-standard ports that are not being used by any other block producer. This is part of our ongoing effort to further diversify the technical possibilities available to the network. BNET Endpoints: p2p.eosio.cr:23881 p2p.eosio.cr:20747 EOS Costa Rica has also decided to provide the network with BNET endpoints. Few other BPs are currently providing BNET protocol, we were compelled to help make more BNET services available to our peers. Testnet API: https://jungle.eosio.cr Our team has been actively engaging with the testnet community providing a widely used public HTTPS endpoint on the Jungle testnet available for anyone in the community to put to use. We have deployed 6 dedicated servers, a dedicated switch, and a firewall device. We also implemented DDoS mitigation and a load balancer, represented in the following diagram. 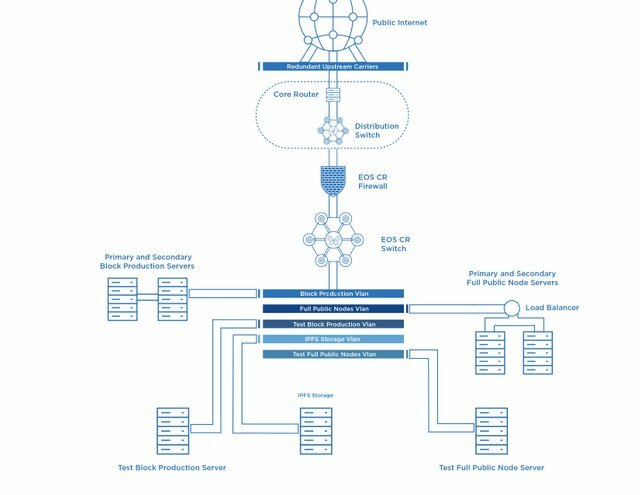 Our technical team is excited about the future release of EOS.IO Storage, which is why we have begun to work on the implementation of InterPlanetary File System (IPFS) in order to provide this service for everyone who holds tokens on a blockchain running EOS.IO software. Storage services make it vital for applications to get the information they need without having to run and maintain their own scalable hosting services. EOS Costa Rica is committed to being on the forefront of providing this service by soon deploying an IPFS node in Costa Rica. We believe that any block producer in Latin America requires having a regional presence, not just at the community level but at the infrastructure level as well. We have begun to investigate the optimal path for deploying EOS.IO nodes throughout the Central and South American regions. Members of our technical team have already visited data centers in Panama and will continue to evaluate options for expansion south in Colombia as well.